A fleet of 12 Rivieras travelled in convoy some 156 nautical miles from Adelaide to Port Lincoln for R Marine South Australia’s annual Port Lincoln Experience. About 60 Riviera owners met for dinner and drinks at the Port Lincoln hotel on day one of the Experience, which gave everyone the chance to meet one another before setting out for Reevesby Island the following day. For Riviera owner Ian Sargent this was his first R Marine Experience. “It was just a fabulous trip and the weather was fantastic,” he said. “I have had my Riviera M400 for three years now and we have only ever taken short day or overnight trips, nothing as far as Port Lincoln, so it’s really opened my eyes to taking our boat further afield. “Travelling in convoy and with the excellent support of R Marine South Australia gave us more confidence and we had the security of knowing that we have help and advice should anything go wrong along the way. 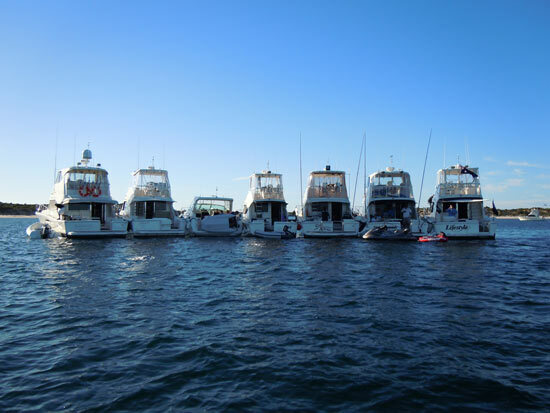 R Marine South Australia’s service manager Dee Bueti said travelling in convoy was a great way to give Riviera owners the opportunity to test their boats in the ocean. “Our master five skipper Tim Arthurson travelled on board with some of our owners and it also gave the other owners more confidence knowing they had an experienced skipper leading them,” Dee said. “About 12 Rivieras rafted up together at Reevesby Island and we all went ashore for a game of beach cricket and a barbecue. Ian, his wife Kathryn, his sister Gail and her husband David all went swimming with the tuna. “I have done a fair bit of diving in my life but the tuna was a fantastic experience. They are so powerful and move extremely quickly in the water, they are like a highly developed machine, they are just amazing,” Ian said. Another Riviera owner Glenn Spear said the Port Lincoln Experience was a wonderful weekend. “It was well organised and enjoyed by everyone who attended,” Glenn said. “The extensive boating experience brought to the Adelaide dealership by Ross Almond and his wonderful team will set a high standard for all dealers to follow. The approach Ross has adopted no doubt stems from his considerable business experience. R Marine South Australia will host another cruising experience later in the year and will inform all South Australian Riviera owners of the details when they come to hand.